Mjölk (Milk) is pure, honest, and essential. Their gallery makes its home in a white Victorian building with a modern interior by local architect firm Studio Junction. 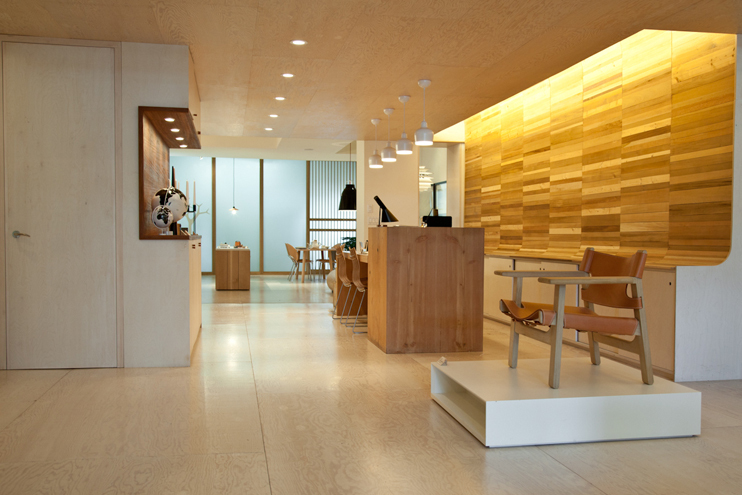 Mjölk is both a gallery who exhibits work by arists and artisans from Scandianvia and Japan, and also a lifestyle store; they look to everyday life to find inspiration for the products they carry. Mjölk’s collection is selected by owners John Baker and Juli Daoust. 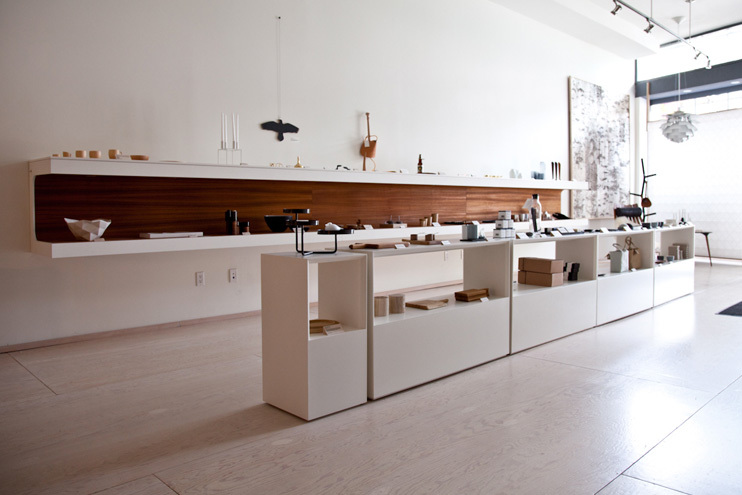 As big fans of Scandinavian and Japanese design the Mjolk store in Toronto is right up our alley, so naturally we have been eager to get in contact with the owners for while now. Recently the opportunity arose for us to connect with co-founder John Baker, who is half of the husband and wife duo, so we began to exchange questions back and forth. Juli and John have built their Mjolk store on a love for minimal yet handcrafted homeware products, presenting Canada with a curation of designs which simply cannot be found elsewhere in their beautiful homeland. In this concise yet elegant conversation we were able to shed a little light on the background of the store, which grew out of their blog Kitka. Alongside this we also speak on the economic downturn and how this can be a positive thing for design, Dieter Rams, and the Canadian creative scene, all of which can be read just below. 1. For those who don’t know, who are you and what do you do? We are John and Juli Baker, and we run a modern design store in Toronto, Canada called Mjolk that specializes in Japanese and Nordic designs. 2. It’s been great following your journey through the Kitka website, how has the blog influenced Mjolk? Do you think you would be doing what you do now without this knowledge and experience? The blog gave us the opportunity to see how well we worked together, and we built a following of readers specifically interested in the Scandinavian aesthetic. We would feature a unique product and readers would tell us how much they loved it, and that they would buy it given the opportunity. It was a brilliant form of unintentional marketing. A look at the front section of Mjölk in Toronto, Canada. 3. 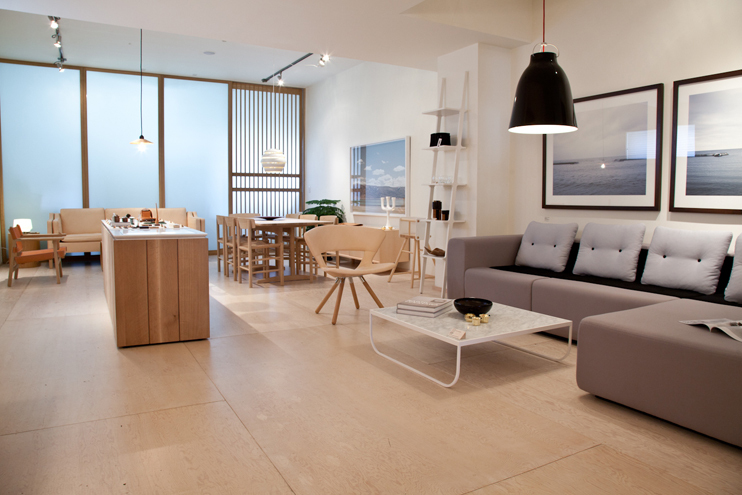 Your shop features a lot of products with a Scandinavian or Japanese aesthetic, what draws you towards this style? I think the aesthetic reflects our ideal lifestyle. A satisfied life with fewer things, but those select things being beautifully crafted, yet quiet. 4. The good thing about the economic downturn is that people seem to be making more things for themselves, surely this can only be a good thing for design the world over? I agree, I think a lot of young designers aren’t waiting around for a big company to see their work and put the object into mass production. We’re seeing a lot of grass roots production, and it’s very inspiring. 5. Are there any particular designers that inspire you, and would you ever consider releasing your own line of products? The basic principals are function, form, and material. We take a lot of inspiration for products from our daily life. We started carrying handmade wooden shoe horns because I couldn’t find one I liked. The one we carry in the store is made of Japanese cherry and gets darker with age, I use it everyday and it’s simply a pleasure to use. Middle section of Mjölk, The Spanish chair by Borge Mogensen takes centre stage. 6. Can it be hard to find the balance of a product that is both well made and handmade? The hardest part is finding things that aren’t too precious. Our biggest goal is finding products that you want to immediately put to use. Everything is meant to be used, especially tea towels. 7. It’s refreshing to see the connection with the creator being restored through Mjolk, how crucial is it that we reestablish acknowledging the skill that goes into making something by hand? It’s incredibly important. We’ve taken a lot of trips and made interviews, workshop tours, and videos of most of the makers we represent in the store. People don’t believe us when we say a wood business card case in made by a single individual. We want everything to be very transparent, if something seems to be a little more expensive we want to have a very rational reason why. 8. Some people might say that the products you pick could be termed as simplistic, modest, pure, do you think this has also creeped in to your lifestyle in some way over the years? I think we’ve really become minimalists over the past 4 years. Our living room currently comprises of 1 sofa, a small side table, and a book case. We only have what we need. The store is filled with such beautiful furniture, so that might satisfy us to some extent. 9. Dietar Rams is a big inspiration for us, his less is more philosophy is obviously something Mjolk embodies in it’s products and it’s aesthetic. Who are the designers that inspire you and why do you think you look to them? I’m glad you brought up Dieter Rams, he is a big inspiration for us as well, along with Naoto Fukasawa, Jasper Morrison and their exhibition Super Normal. 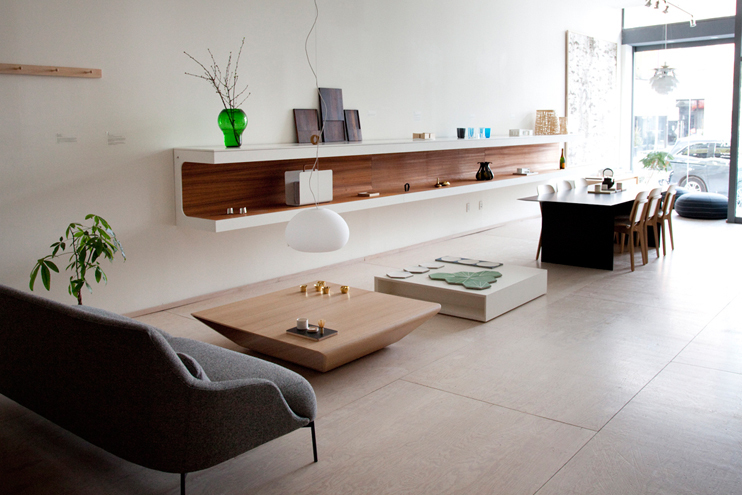 I’m not a person who has favourites but I most admire Danish designer Borge Mogensen. He is the fine wine of Danish modernism, at first glance his pieces are simplistic. After you spend some time studying the construction of his work and sit in his chairs you realize he never compromised on anything, craftsmanship, materials, and above all else functionality. That last one is something that many of his Danish counter-parts never fully committed to. Ha! The back section of Mjölk in Toronto, Canada. 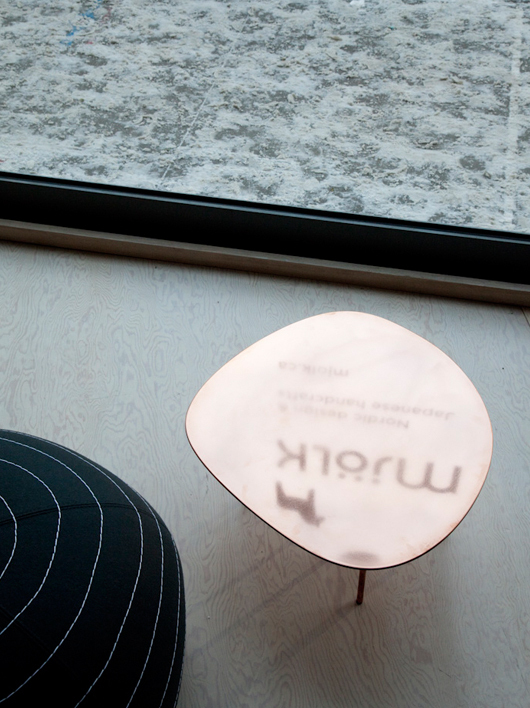 Pictured is the Mundo Lounge chair by Susanne Grønlund. 10. The Canadian creative scene seems to be looking pretty healthy right now, it must be great to be amongst it all, so with this in mind what other stores stand out to you at the moment? The scene is quite healthy, but I think we could do a lot more in promoting our own designers. 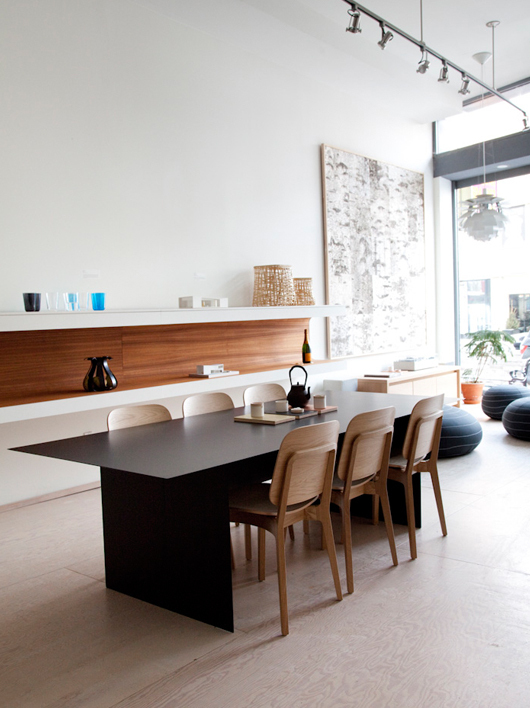 The main store selling Canadian design in Toronto is MADE. 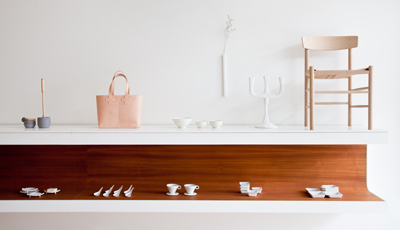 Another great shop that carries a variety of Canadian designs as well as design from abroad in Klaus by Nienkamper. 11. What sets Mjolk aside from it’s competitors and why should someone shop at your store if they haven’t already? I think we put a lot of emphasis on experience here in the store. We collaborated with our favourite local architect firm Studio Junction on the interior of the space, and every display case is thoughtfully custom made. When we opened our online store we wanted to make sure the experience of the store carried through to the customer, so we try to wrap items in nice wax paper, and we created custom boxes that have different milk themed motifs. Our favourite looks like an old wire basket with milk bottles in it. 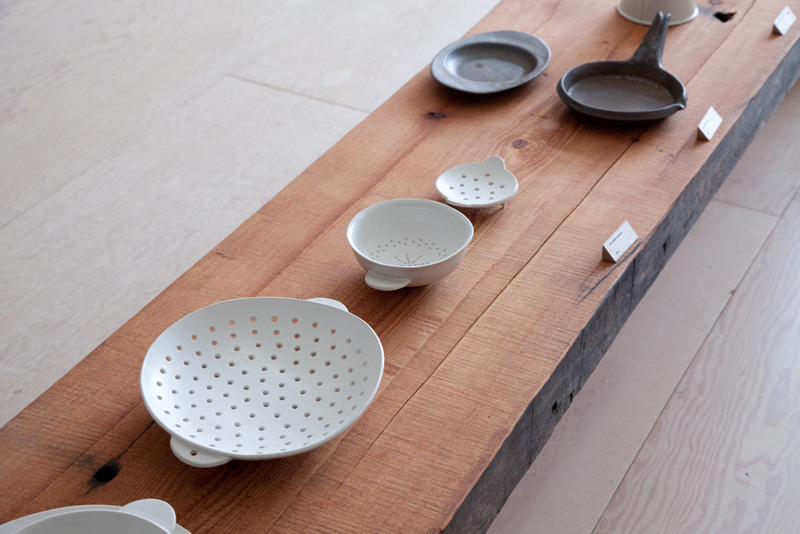 Beautiful functional ceramics in the front showroom. 12. Most of the products you stock must be incredibly hard to find, very much a challenge to even get them in store, how do you go about getting in touch with these small independent creatives and designers? It’s still incredibly challenging. In the beginning most people didn’t reply back to us, but having the store for a couple years and building a good reputation it’s becoming a bit easier for these independent designers to take a chance on us. The last trip we wanted to nail down three really important designers, and we had to introduce ourselves, visit their studios, and have some lunch in order for them to let us make an order. 13. Finally, we’ve seen your recent collaboration with HOI BO on a set of leather products. Do you have any other projects like this in the pipeline? That was an amazing experience, I’ve always been so interested in the development of a product, and working with Sarra locally was great because we could all go out for dinner and brainstorm different ideas. I think the future of our store is having a fair share of products produced locally, whether the designer is local or international. The front area of the shop where they’re selling small crafted goods, such as Oji Masanori’s brass objects and Takahashi Kougei’s wooden cups and plates.